Term Life Insurance or Protection Insurance is the cheapest form of Life Insurance available in the market. Term Insurance offer you high value protection on the occurrence of an unfortunate event and that too at an affordable cost. Being said that, once you enter the insurance market in search of term plans, the plethora of products and options are likely to confuse you. Further more, as you are bound to stick to your purchased term plan for your life, choosing the plan and it’s details wisely at the time of purchase is of utmost importance. This article is intended to guide you in selecting your term plan, based on your insurance needs. 1. Term Life Insurance Policy- why do you need it? If we study the general variation of income with age, we can identify certain trends prevailing in every ones life. In the initial years of the career development, income will be low but the need of insurance will be high. As the purchasing power is low the only possible way to get sufficiently insured is through term Insurance policies. Even though savings plans are good to accumulate wealth for the future needs, the priority has to be given for a term insurance in the initial years of the career. Slowly as the person climbs up in the career ladder, his income and purchasing power will increase. So in the later stages of his career, he can afford savings plans, which can provide protection and savings hand in hand. 2. How much term life insurance do I need? First and the fore most thing to be considered before taking a term insurance policy is the optimum insurance coverage for you. Human Life Value Concept (HLV) developed by S S Hubener is followed through out the world to quantify the required insurance coverage for any person at any point of time. InsuranceFunda has created an easy and simple HLV Calculator which can be used to quantify your insurance needs. Click here to open HLV Calculator. 3. 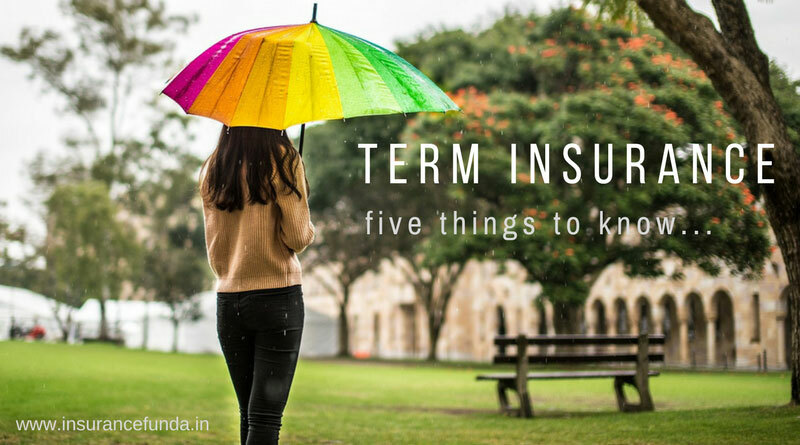 How long do you require term life insurance coverage? Term Insurance is intended to protect you and your family from unexpected and unfortunate events during your earning period. In other words, ideally the term assurance should cover your entire income earning period. For employees, the term insurance should at least cover the service period and can end by the period of retirement. On the other hand, for people with other income sources such as business and agriculture, term insurance period can be fixed in two ways. 4. From where I shall take my term life insurance policy? The prime intention behind purchasing a term insurance plan is to get insured amount on the unfortunate death of the insured person. And hence, there is no need to add that, getting the claim settled in a prompt and speedy manner is of prime importance. Consequently, the track record of the insurance companies in settling the death claim is really important. IRDA through its annual report, gives a clear idea on the claim settlement ratio of insurance companies of India. Read more on the claim settlement ratio and detailed comparison of insurance companies in India, based on IRDA’s latest report. Life Insurance Corporation(LIC) of India is setting standards in Claim Settlement by topping the chart with a claim settlement ratio of 98.33%. Most popular term life insurance plans in India. Of late, owing to the increase in insurance awareness and internet usage among younger generation, online mode of policy purchase is gaining popularity. As the cost of sale is lower, Insurance companies are passing the benefit to policy holders as reduction in premium. Life Insurance Corporation of India has released the online term insurance plan with the name LIC e-Term which cheaper than its offline counterparts. Jeevan Arogya – T 904 Health Insurance plan from LIC. Best and worst Insurance companies in India base on claim settlement. ULIP Vs Mutual fund – which is better investment.